Ryan Adams has re-joined the staff after a couple of years in the insurance industry. 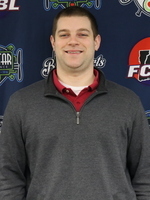 Ryan first worked for the Bravehearts in their inaugural season of 2014 and could be heard by thousands of fans as the team's Public Address announcer. After two years living in Chicago, IL and Sacramento, CA while working for The Hanover Insurance Group, he has returned to Worcester to work in and give back to the city he loves. Ryan is a graduate of St. John’s High School and Bentley University with a degree in Managerial Economics. He loves talking and playing sports all the time and is currently training for his first season of rugby.